Again, I am sure you would be fine with just half of what I am preparing here, but then again, the dough I don’t need I put in the fridge. 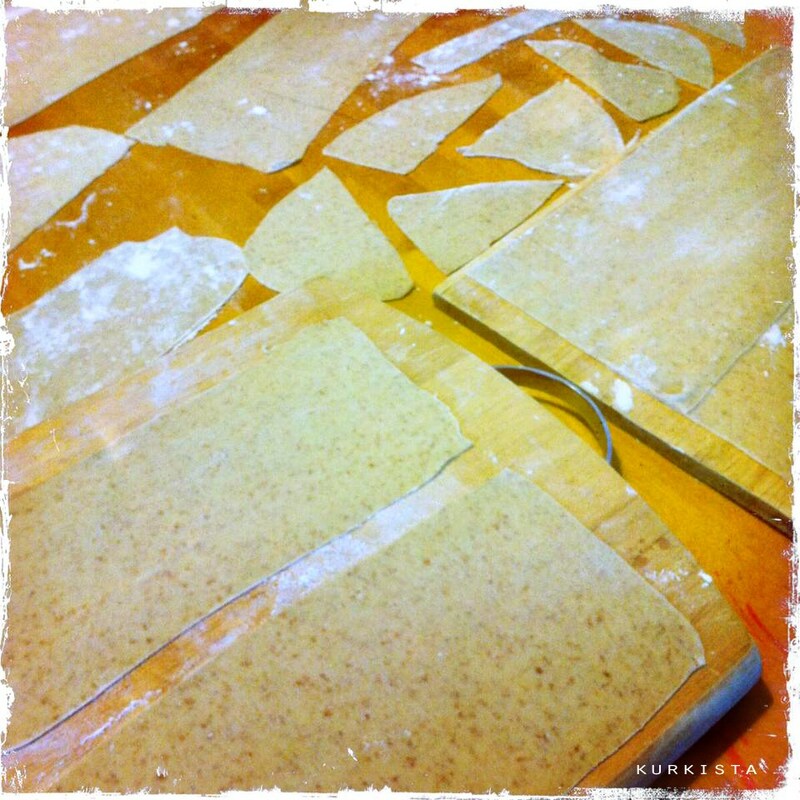 Toss everything together and knead until you have a nice dry but somewhat elastic dough. 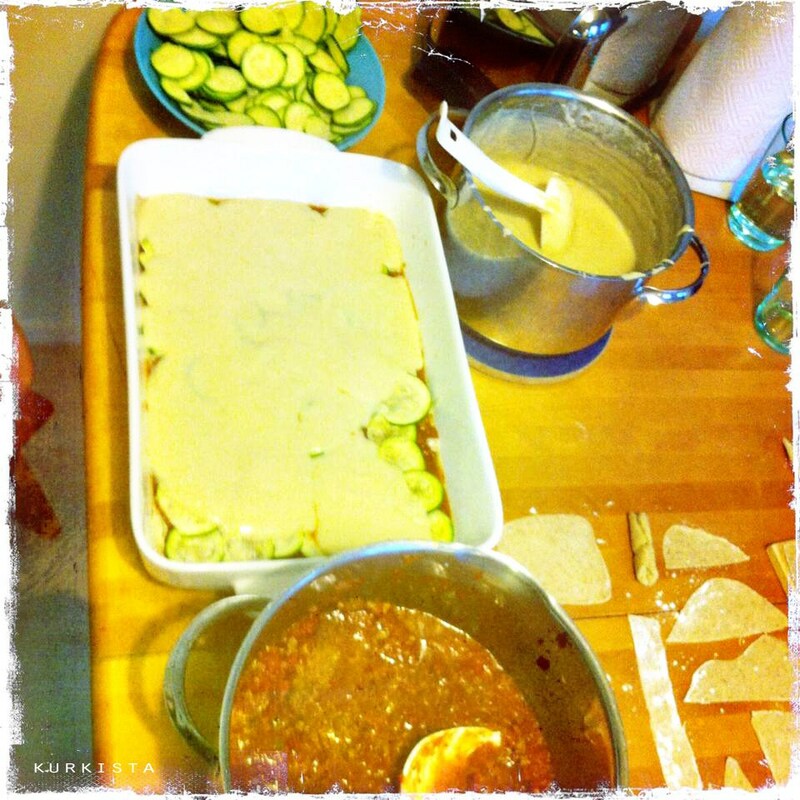 We don’t have the famous durum flour so in my case white (3 dl) and whole grain flour (1 dl) will do. 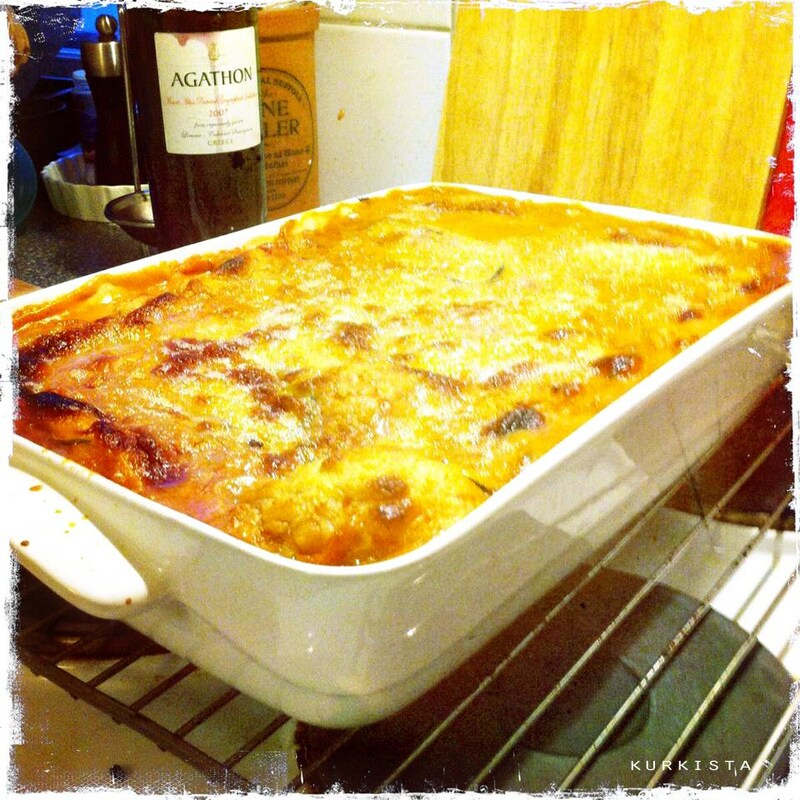 I use a Marcato Atlas pasta machine to produce the lasagne plates – a thickness around 5 on the machine’s scale is good enough. Make sure to air dry the pasta properly (why not do it the day before already?) or even quickly dry it in the oven prior to layering… otherwise the pasta will dissolve once in the oven. This blog entry has not been sponsored by any of the brands in this post. I have purchased all ingredients with my own money. I am explicitly using the brand names since I believe it is important to know what to use in order to be able to reproduce the meal described here. Take a large pot, lots of olive oil and don’t be parsimonious about it! Add the red onion (generously diced) and then very gently squashed garlic cloves and any spice you fancy, lid on and leave it there for a 2-3 minutes. Bring in the protein and keep stirring if you are afraid of some more olive oil and finally the crushed tomatoes, a quick boil up and then lower the heat. Since I am the only one in our family who enjoys garlic as such I fish out the cloves before the layering. Now I guess here comes the crucial point for making a savoury lasagne: cook the tomato sauce for a long time, actually simmer it and by long I mean 2-3 hours, but this is optional! 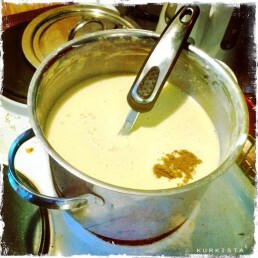 Another large pot is required for the white sauce. Use what ever fat you like (oil, margarine or butter), heat it up and add the flour, stir until all the fat has been soak up, you get little flour balls. Pour in the liquids. Whisk gently, gradually rising pace. 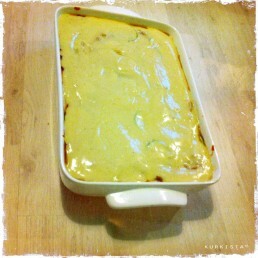 It is actually quite easy – initially I used GialloZafferano‘s instructions on how to do a béchamel sauce. You need to find the right balance between not too liquid and not too firm and make sure you don’t burn it! 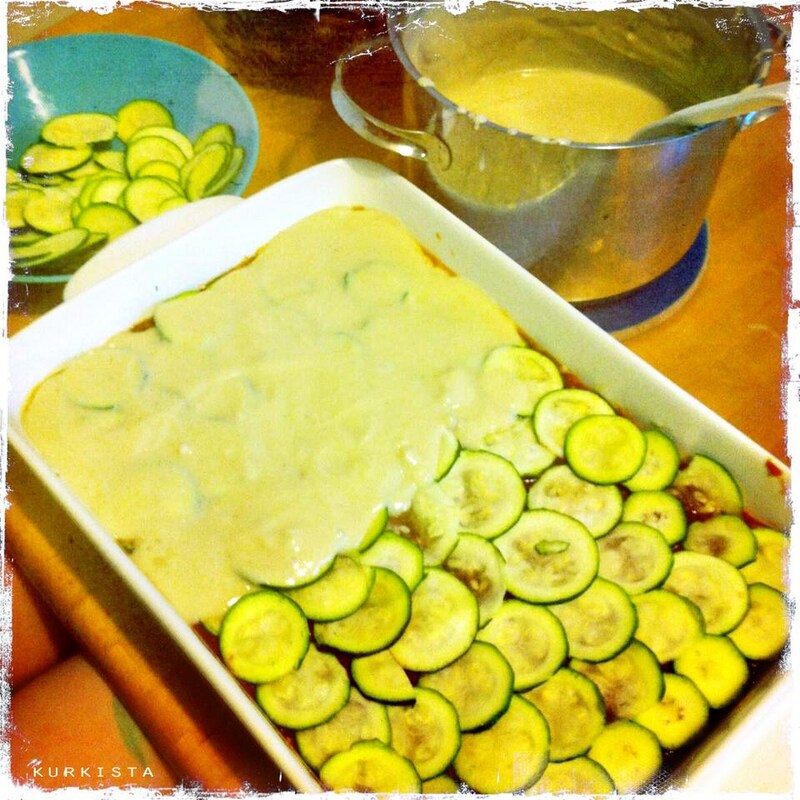 Before the layering thinly slice the courgettes, a grater is my choice here! You could consider quickly frying the sliced courgettes to get rid of some of the moisture. Pre-heat the oven to 225°C Degrees and have it sweating for 40 minutes. 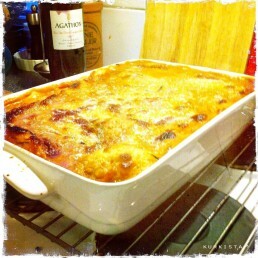 Make sure you let the lasagne rest for a while so it inspissates.